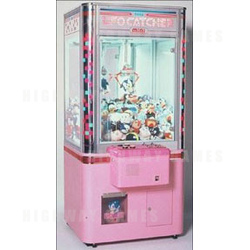 The UFO Catcher Mini is a crane machine released by Sega in 1991. It is a one-player version of the New UFO Catcher, and it is the first time a cabinet in this series had been adapted this way. Players use the buttons on the control panel to move the crane to their desired toy. By either pressing a button or letting the timer run out, the claw will then descend and try to grab the toy. It will then lift and move towards the drop off zone, dropping the toy if the player has been successful.